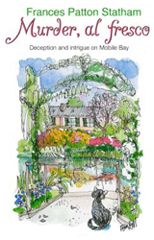 From restoring the gardens on a Mobile Bay estate, turned into an artists’ colony, to being trapped on an offshore island with a murderer, Carley Burnside, a young landscape architect, discovers that things are not always as they seem. Drawing cards with her identical twin Morgan, for one of two houses in her grandmother’s will, Carley also inherits her poker club, her feng shui housekeeper, two Maltese cats, and disturbing family secrets that threaten her life. Switched identities, a smuggling ring, eccentric artists, and a wickedly handsome undercover CIA agent have to be dealt with as Carley struggles to survive the hazardous journey from murderous intent to love in a lush coastal paradise.